Evolving Terrain brings together four artists’ work, placed throughout Fort Tryon Park. 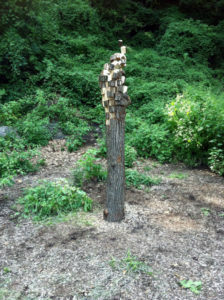 Their work addresses the natural landscape within an ever-changing city, and hopes to create a dialogue between communities, artists and nature, and the ways in which the natural realm supports the built environment. Artworks will be on view until 1 January 2017. 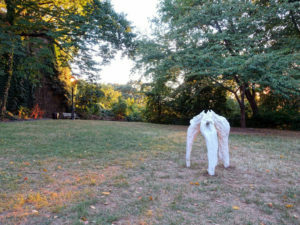 On Sunday 25 September at 3pm, there will be a guided walk led by NYC Parks, Fort Tryon Park Trust and NoMAA, to view the artworks and meet the artists. The artists will speak about their work and the inspiration they drew from the park’s sublime landscape and its abundant natural features. The walk will meet at the Heather Garden; enter the park at Margaret Corbin Circle. The intentional misspelling of a word defined as steady persistence in the face of difficulty, reflects word-jam rhetoric and object-hood of a whimsical composition. This symbolic representation of perseverance provides the empirical course of its creation: sieving individual units of a whole to denote a type of errance from its original form and purpose. Not unlike the whimsy at which society/culture/economy abuse nature as an omnipresent source of material wealth, rampant acquisition and progress for the technological kowtow, Perseiverrance offers a spectacle of shuffled reality in recorded natural time that mirrors derangement of what defines human progress. Ms. Shachnow makes large-scale sculptures with the purpose of creating beauty in everyday objects. Her large-scale installation of “Golden Pears” highlights the connection between the importance of the earth’s natural environment and its ability to support the food we grow to sustain life. 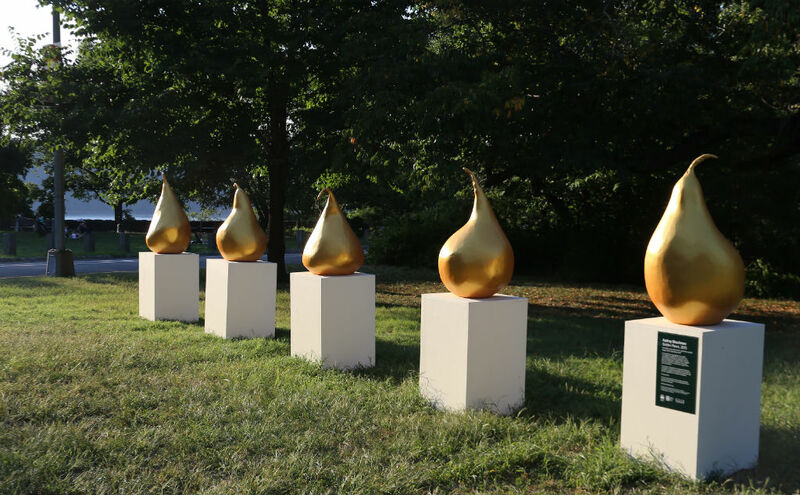 The Golden Pears invite a dialogue between the trees and the park setting, reminding us of the importance of preserving nature. To learn more please visit AudreyShachnow.com. “bench V (basics)” is a site-specific installation that continues a body of work under the title “basics,” exploring an abstracted notion of form, material, space and utility. “Basics” is based on a constructive logic of additive 2×4 wood studs that allow a monumentality through everyday means. 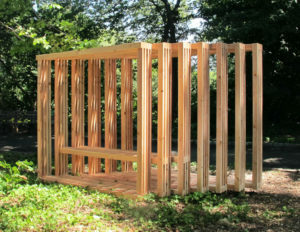 The work wants to be experienced both as an abstract sculptural gesture as well as an interactive spatial environment. “Basics” encourages an uncertainty in the dialog between the viewer and the work, opening possibilities in the public quality and appropriation of the work. 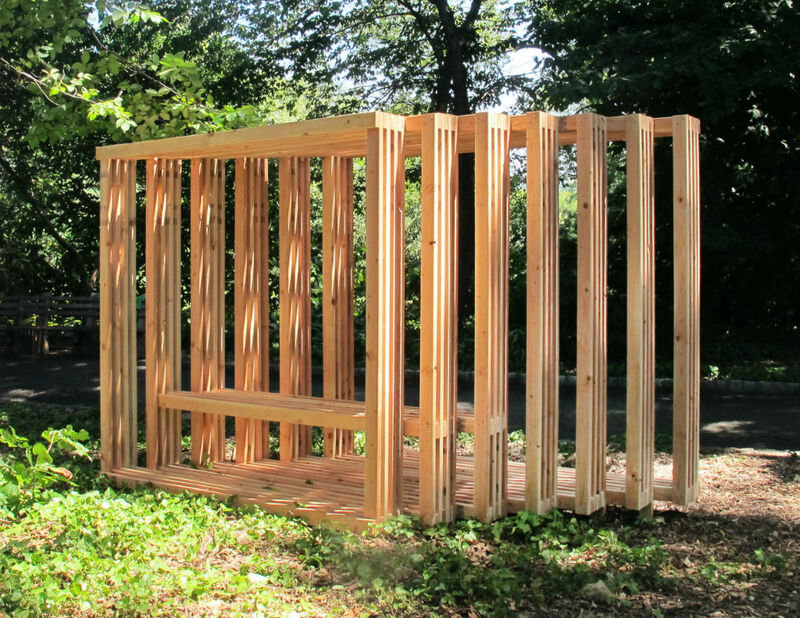 The temporality of the site-specific intervention is mirrored by the material and constructive logic of the work. Matthias Neumann is trained as an architect. His work has been widely exhibited nationally and internationally. 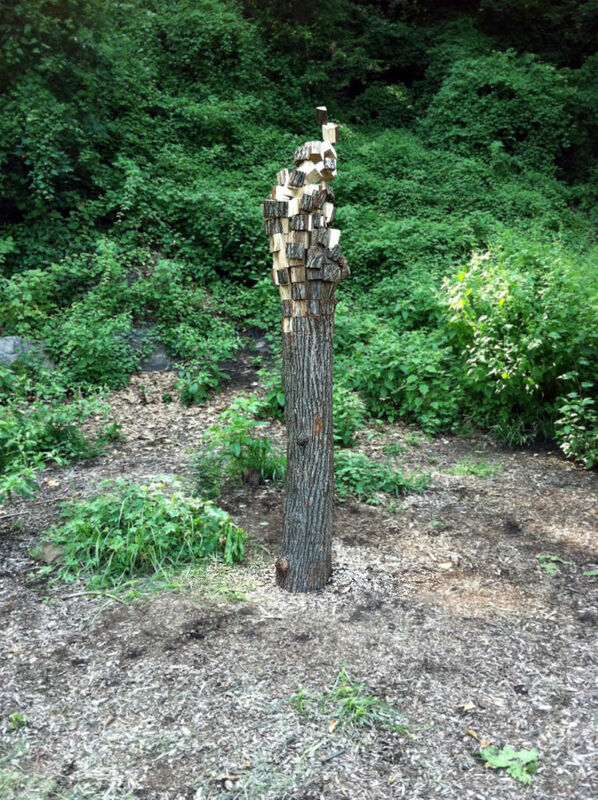 “Tripod” is made up of three casts of a found piece of rotting wood. It is remade in ghostly matte white in reference to death masks and homage to the object’s prior life. The wood is elevated to a place of honor generally reserved for well-known, and/or well-regarded, human subjects.